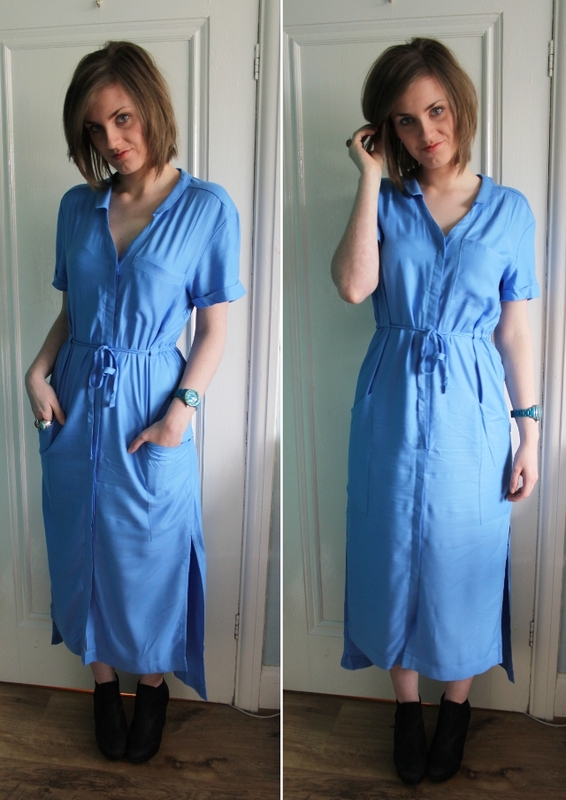 Today I wore a dress I was kindly sent by Zalando a couple of weeks back. I’ve been waiting for the right weather to wear it as it’s such a summery dress, and when I saw the rain outside my window this morning I thought it would be a bit too much, but luckily for me the sun soon came out so on it went! This dress is from the high fashion Zalando Collection, which is made up of some gorgeous on trend pieces exclusive to the company, and some designer collaborations too! When the weather gets warmer I would wear this with some wedges, but for now I dug out my trusty Topshop Allegra boots. I love the shape of the dress and how it splits at the side with a dip hem at the back. It’s not like anything I’ve seen on the High Street lately so it has a real unique feel about it. The colour is great too, and I love wearing blue as I feel it really suits my skintone. It’s also available in black if you wanted a more demure colour. I think this is going to be a really versatile addition to my wardrobe as it will be suited to day and night and easily dressed up or down with the right shoes and accessories. Thanks Zalando! I’ve had such a lovely relaxing weekend at home and can’t believe it’s gone so fast. I’m wishing the next week away so that the weekend will be here again! As I mentioned yesterday, I baked Red Velvet cakes from the Hummingbird Bakery book. They taste just like the real thing if I may say so myself! Here they are in all their glory. How have you spent your weekend? Hope you’ve all had a good one! I love the hummingbird red velvet cakes! My fave. Lovely dress! just found your blog, you are such an inspiration! Yum at the cakes! And ooo at the dress – such a pretty colour and shape.